Easter Island. The Kerguelen Islands. Niue. The Pitcairn Islands. St. Helena, Ascension, and Tristan da Cunha. These are some of the most remote islands in the world. They’re obviously isolated. They’re hard to reach. While the communities that live on them are small and incredibly tight-knit. A group of Alaskan islands can be added to this list. At first, Alaska doesn’t sound that remote. The Last Frontier became part of the United States in 1959. It borders both British Columbia and the Yukon in Canada. While the mainland of Russia is only 55 miles across the Bering Strait at its narrowest point. But Alaska is huge. At more than 660,000 square miles, it’s more than twice the size of Texas. The international date line swings far west to accommodate it. So it’s actually not surprising that the 49th state includes some very remote—and incredibly fascinating—islands. The Aleutian Islands extend 1,200 miles southwest from the Alaskan Peninsula toward the Kamchatka Peninsula in Russia. Since the islands—14 big, 55 small, and too many islets to count—separate the Bering Sea from the Pacific Ocean, they’re considered the northernmost part of the Ring of Fire. The Land of the Aleuts is, of course, volcanic. It’s full of steep, treeless mountains; large colonies of seabirds; World War II historic sites; and fishermen. King crab fishermen. If you’ve heard of the Aleutian Islands, it’s probably because of Deadliest Catch. The television series follows king crab fishermen from Dutch Harbor on Unalaska Island out to the Bering Sea. The Dutch, a protected port, is the largest fishery (by volume) in the United States. It first became an important fishing hub in the 1970s; an even bigger boom occured in the mid-1980s. Before that, the islands were the center of the hard-fought Aleutian Islands Campaign during World War II. The United States purchased Alaska from Russia in 1867. The Russians arrived in the second half of the 18th century; they killed or subjugated the Aleut people in the process. While, long before that, the connected islands probably brought the first people from Asia to the Americas. 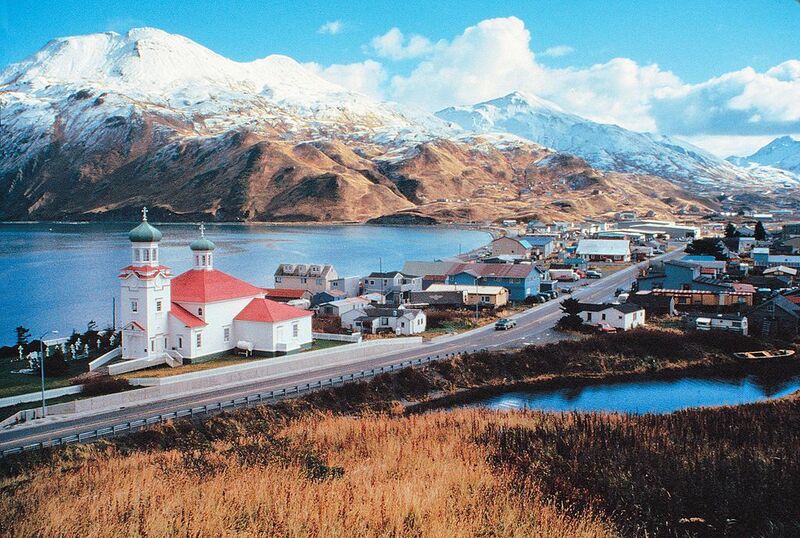 Unalaska is the best place to learn about much of this history. The Aleutian Islands’ largest settlement has grown from a tiny fishing village into a great fishing port. Along with the Dutch, it’s home to the Museum of the Aleutians (Aleutian culture), the Church of the Holy Ascension (the oldest Russian-built church in the United States), and the Aleutian World War II National Historic Area (Fort Schwatka on Mount Ballyhoo). The only problem is getting there. Harsh weather conditions cause a high percentage of flight cancellations to Unalaska Airport. It could make your trip a lot longer, but your arrival will feel like an even greater accomplishment.